Netherlands - interesting country, not only in terms of tourism, but also as a place to invest in real estate and relocation for a permanent residence. Broad opportunities to conduct your own business in a highly developed country will give space for your business. Own properties in Netherlands - a profitable and promising acquisition. Buying realty in the Netherlands is a safe investment. The global financial crisis, of course, has a little impact on the housing market in the country, but only in the form of a slight reduction in sales volume and as a correction of pricing. In other respects the country still represents the stability and confidence. Flats and houses in large cities are in constant demand for rental, because the flow of tourists, students and business people is constant. Real estate in the capital of the Netherlands - more than just a promising investment - the price will certainly grow and the demand for rental or purchase will always be relevant. The cost of real estate in the Netherlands is quite comparable with the prices of analogues in the prestigious European countries. Of course, it cannot be called very cheap, but in quiet provincial cities in the country can be bought low-cost housing, which will look cheap, even against the background of European prices - all depends on your possibilities and preferences. If you want to find yourself in the center of events, the acquisition of real estate in Amsterdam or large cities such as The Hague and Rotterdam – your option. Of course, prices in these metropolitan areas are high, especially in the center, but it's worth it! You will not worry about your future and the future of our children, which is important in these uncertain times. 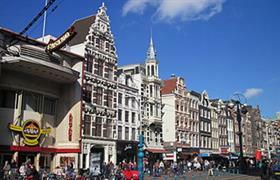 Sale of housing and commercial space for foreign investors in the Netherlands is not limited. Buying and registration procedures are quite simple. A foreigner has the right to register property both as physical person or legal entity. The acquisition of commercial property will give you the opportunity to start your own production in the country and access to European markets. Foreign nationals receive rights for citizenship after five years of residence in the Netherlands.